Scientists exploring the deepest place on Earth — the Mariana Trench in the Pacific Ocean — have captured footage of a never-before-seen fish at a record depth of 26,722 feet (8,145 meters). As reported in New Scientist, the ghostly fish was spotted by an expedition led by Jeff Drazen and Patty Fryer of the University of Hawaii. Marine biologists suspect that the new species is a kind of snailfish, but they're not entirely sure; its body is shaped differently from other known varieties. It has broad, translucent fins, "stringy appendages," and a tail that allows it to glide gently through the water. It appears to be 'rowing' through the water with its strange fin-like appendages. "We think it is a snailfish, but it's so weird-looking; it's up in the air in terms of what it is," said team member Alan Jamieson in a BBC article. "It is unbelievably fragile, and when it swims, it looks like it has wet tissue paper floating behind it. And it has a weird snout — it looks like a cartoon dog snout." Whatever if is, the newly discovered animal has set a new record for a deep-sea fish. 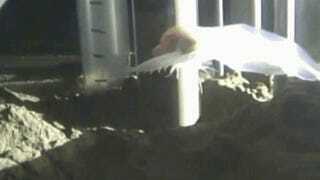 Prior to this mission, a different species of snailfish, the gelatinous Pseudoliparis amblystomopsis, was spotted at a depth of 25,272 feet (7,703 meters). During this latest expedition, the Hadal Ecosystem Studies team thought they had broken the deepest-fish record at 26,246 feet (8,000 meters), but when they moved further down another 475 feet (145 meters), another snailfish appeared. The scientists also captured footage of another strange species, supergiants. They're amphipods that normally measure 2-3 cm (0.79-1.1 inches) long. But the ones down there can reach up to 30 cm (12 inches). The fact that animals can survive at such depths is nothing short of incredible. They have to endure the weight of more than 5 miles (8 km) of water above them. As noted in New Scientist, "Handling the intense pressure of the deep sea is a challenge for most animals because it impedes muscles and nerves and bends proteins out of shape, disrupting the working of enzymes required for life." And indeed, the newly discovered fish is close to the limit at which fish can survive. Read more at New Scientist and the BBC.